As I returned The Talons of Weng-Chiang to my friend, I mentioned to him that the current Doctor Who thread on a forum I frequent is titled “Doctor Who – We swear, Timelash isn’t that bad!” From there, the conversation went to Colin Baker serials, and I told him the only serial I’ve seen of Colin’s is Vengeance on Varos. I’ve never had an urge to seek out the Sixth Doctor’s TV run because of all the drama and bad things I’ve heard about this time on television, and was extremely happy with Colin’s work with Big Finish. So last week, what should appear in my stepdaughter’s backpack but the DVD for Attack of the Cybermen! “How nice of him,” I thought as I popped it in the DVD player. It doesn’t come as any surprise that this is an Eric Saward script. Saward’s strength has always been establishing atmosphere, from the dark sewers of London to the rocky and forlorn surface of Telos, and even down to the tombs of the Cybermen, some of which are still inhabited by decaying-but-still-active Cybermen. The scene where a rotting Cyberman smashes out the tomb to attack Peri caught me off guard and it took a scene or two for me to recover. There are also various plotlines that are woven together; the Doctor’s quest to find the source of an alien signal, a mercenary’s heist turns out to cover a far more ingenious plot, and two slaves attempt to escape the Cybermen, and that’s all before the second episode introduces the Cyrons and their struggle against the Cybermen. Saward weaves these strands together skillfully, so every character has a purpose and there is little wasted plot, though the time it takes to get going might cause the viewer to glance at the running time now and again. One of the behind-the-scene tidbits for Attack of the Cybermen is that, even though the script was written by Eric Saward, he couldn’t take credit for it because of Writer’s Guild guildines about script editors taking credit for actual scripts. So, the episode is “written” by Paula Moore, aka Paula Woosley…but everyone’s favorite continuity junkie, Ian “Matter Eater Lad” Levine, claimed HE came up with the story idea. 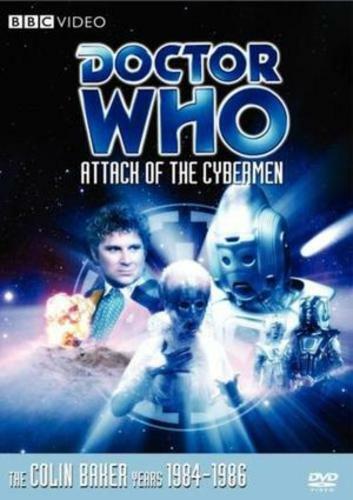 There is credence to that claim, as Attack is dripping with continuity references; Peri mentions several former companions, the TARDIS appears at Trotter’s Lane, previous stories and serials are referenced, and even a character from the Fifth Doctor’s run shows up to play an important part! The references don’t detract from the story save for their heavy handedness. Attack is a more action-packed and violent serial than most. The Cybermen are shown to be incredibly dangerous as a light tap from one of them kills an undercover policemen (an out-of-makeup Terry “Davros” Malloy!) and they crush a man’s hands by squeezing them until the bones break, the bloody pulp shown on TV in their full “glory.” Even the Doctor gets in on the act, as in the climax of the story the Doctor kills several Cybermen with their own weapons. I don’t mind the violence, as the Doctor has killed time and time again, almost always in a “kill or be killed” situation (The Dominators is the best example of this). But it’s how the serial, and the Sixth Doctor, almost revel in it. The Doctor shows very little remorse or reflection of his violent actions, sometimes taking it as a first response instead of a last resort. This would continue into Vengeance on Varos and the “acid bath” scene, but its roots definitely are shown in this story. Viewers also get to see the act of cyberconversion for the first time. The act of turning a sentient being into a Cyberman isn’t pretty, as limbs are lopped off, parts are scooped out, and weird metal things are attached to the body. The special effects, of course, don’t compare to the special effects accompanying Borg assimilation, but for the mid 1980’s it was pretty horrifying stuff! Maurice Colbourne, aka Lytton from Resurrection of the Daleks, makes his return as the tough-talking, double-crossing mercenary. Lytton wasn’t exactly a character fans were clamoring to see again, but Colbourne plays his part well, trying to make up for the sins he committed working for the Daleks. The other secondary characters, however, seem to exist just to be killed off; the two escaped slaves and the English criminal who was brought to Telos as a prisoner end up gunned down just seconds from a clean getaway. And the leader of the Cyrons melts (well, dry ices) to death as the Cybermen expose her to high temperatures. It’s a body count number that Steven Moffat would be proud of. My problem with Attack of the Cybermen is with the dynamic between Six and Peri. No one can deny Colin Baker and Nicola Bryant have wonderful chemistry, which definitely comes through on the DVD commentaries and the works of Big Finish (and The Airzone Solution, but we don’t talk about THAT, will we? ), and it managed to shine through at times during their TV run. There are small moments in this story, such as Peri ducking under a tracking device the Doctor casually swings around, but other than that, everything the Doctor says to Peri drips of condensation and everything Peri says to the Doctor is laced with scorn. This isn’t Doctor Who, it’s an abusive relationship! Apart, the pair have some moments; Peri throws brick dust in the eyes of a menacing policeman and grabs his gun, while Baker responds to the question of whether or not he’s a Time Lord with “YES, AND AN ANGRY ONE!” Together, though, the pair are NOT enjoyable. There’s bickering, like Two/Jamie or Three/Liz, and ribbing, like Five/Tegan. But this is just the Doctor and companion being MEAN to each other. Why the hell would Peri travel with this mad man? Why would the Doctor put up with this shrieking shrew? The two of them arguing with each other isn’t good TV, it’s probable cause! By itself, Attack of the Cybermen could have been a serial where the individual parts more than make up for the story’s weak nature. But watching Six and Peri consistently tear into each other is an affront to the entire Doctor/companion relationship and drags the whole thing down. This entry was posted in Random Thoughts and tagged Colin Baker, cybermen, Doctor Who, Nicola Bryant, Peri Brown, Sixth Doctor, TARDIS. Bookmark the permalink. Yes, you can borrow “Inferno”. And have you seen “Mark of the Rani”? If not, I have to lend you that one too.